April to August: 10.00 10 19.00 (Monday to Thursday), 10.00 to 20.00 (Friday to Sunday). October and March: 10.00 to 18.00. 28 October to 20 November and January: 10.00 to 16.00. 21 November to December: 10.00 to 15.30. Last entrance is always 1 hour prior to closing time. Daily at 11.00 and 13.30. You van visit Kew Gardens all year round. The gardens are most impressive during the spring and summer. We are comparing Kew Gardens and Palace Tickets Prices from leading ticket suppliers and Try to find you Cheap tickets prices on the market. Kew Gardens were founded in the year 1840. Now listed as a UNESCO World Heritage Site, this incredible open-air botanic museum is one of the most unique places to visit in London. A world apart from the polluted streets and noisy roads of Central London, Kew Gardens offer a peaceful retreat for local London’s as well as international visitors. Inside this whopping 121-hectare garden you can find an over 30,000 varieties of plants as well as a treetop trail suspended 18 metres above the ground, two innovative art galleries, and a Tropical rainforest containing plants from The Americas, Asia, Australia, New Zealand and Africa. As if that wasn’t cool enough, the Tropical Rainforest is hosted by the largest Glasshouse of the Victorian era (now a Grade 1 listed building). Without a doubt Kew Gardens is one of the most unique UNESCO protected sites in Britain. Perfect for nature lovers and for people who who’d like to experience some peace and quiet inside the busy British Capital. A perfect place to visit for a family outing, kids can enjoy playing in the fresh air of the botanical gardens and share a picnic or café sandwiched. 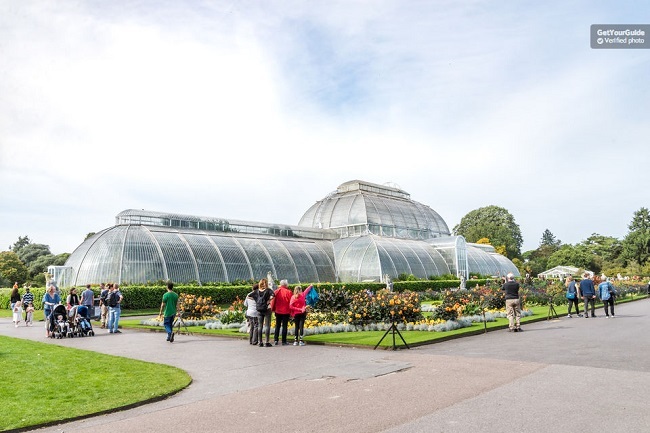 Attractions within the Kew Gardens combine nature with art and history so this excursion should please a wide variety of people and personalities. Your Experience With Kew Gardens and Palace Tickets? Take a day away from the London traffic to immerse yourself in the beautiful smells, colours and sights of Kew Gardens. Enjoy the novelty of a tropical rainforest filled with exotic plants on the outskirts of a busy city. Feel like you’re walking in the midst of a great forest when you visit the gardens Arboretum. Walk 18 metres above the ground and take in views of the 121-hectare gardens. Soak in the fresh citrus scents of the 10 story Orangery. Learn about Kew Gardens on a free walking tour of the site. Fast track your entrance with a skip the line entrance ticket and explore the gardens at your own leisure. What Kew Gardens and Palace Tickets Includes? Entrance ticket to Kew Gardens. Access to the Treetop Walkway, Kew Palace, Art Galleries, and Gardens Under Glass. Free walking tour of the gardens. Free map and seasonal guide to Kew Gardens. We recommend taking a minute to look at your free map and plan a route around the gardens to avoid missing the highlights or having to double back. Travelers Reviews about Kew Gardens and Palace Tickets? Travellers on TripAdvisor have given this attraction and overall 4.5 out of 5-star score. On Get your Guide the Kew Gardens has 4.6 out of 5 and on Viator the attraction has a full 5 out of 5-stars from happy visitors. Reviews describe the Kew botanic gardens as ‘a hidden gem’ and ‘beautifully understated. Some comments mention that the queues are a bit confusing but overall reviews are very positive. Visitors have also mentioned that Kew Gardens has a good selection of food available in the onsite café. Kew Gardens are fully wheelchair accessible (including the treetop walkway). You will receive confirmations of your booking at the time of purchase (via SMS or email). Tickets for this attraction can be printed or brought in electronic form. Refund and cancellation policies will depend on the individual tour provider so you should check their website if your plans change. You may be entitled to a full or partial refund however this will depend on how far in advance the cancellation is made. Mobile tickets are accepted so there is no need to print your ticket. Key Palace will be closed during the winter months (September to March). Meeting Point: you can go directly to the entrance (Lichfield Road) without queueing. Address: Royal Botanic Gardens, Kew, Richmond TW9 3AB, United Kingdom, London.